1Research Professor, Dentistry School, Universidad Cooperativa de Colombia, Pasto, Colombia. 2Dentistry Research Group Director, Dentistry School, Universidad Cooperativa de Colombia, Pasto, Colombia. * This work was supported by a grant from Comité Nacional para el Desarrollo de la Investigación (CONADI), Universidad Cooperativa de Colombia, Pasto, Colombia. Objective: To establish the periodontal status in female psychiatric patients from «Nuestra Señora del Perpetuo Socorro» Mental Hospital at Pasto, Colombia in 2007. Methodology: We evaluated 59 patients and assessed Quigley-Hein and sulcus bleeding indexes, clinical attachment loss, probing depth, gingival enlargement, tooth displacement, and furcation involvement. Variables such as age, hospitalization, mental illness, other systemic condition and psychiatric medications were analyzed. 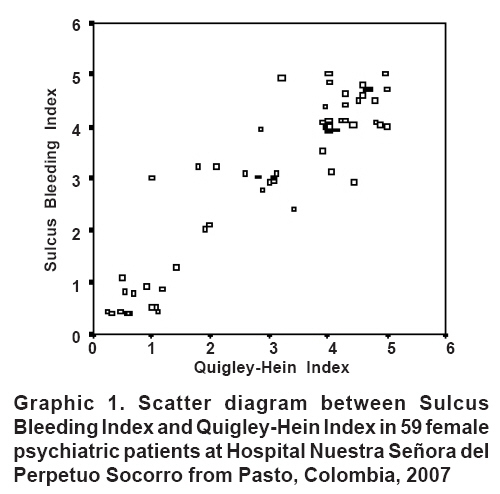 Results: The Quigley-Hein Index was 3.05, SD=1.56, sulcus bleeding index on probing index was 3.08, SD=1.54. Of the women 49.2% had a clinical attachment loss (CAL) of 7 mm. There was an increasing percentage of CAL from 5 to 7 mm in patients with more than 10 years of hospitalization. Women with schizophrenia and mental retardation showed CAL from 2 to 7 mm. Patients who ingested antipsychotics-antiparkinsonians had CAL of 17 mm. Conclusions: Periodontal disease is severe in these patients and might be influenced by hospitalization, mental illness, and medication. Keywords: Psychiatric patients; Women; Oral hygiene; Gingival bleeding; Probing depth; Clinical attachment loss; Periodontal disease. Objetivo: Establecer el estado periodontal de pacientes psiquiátricas del Hospital Mental «Nuestra Señora del Perpetuo Socorro» en Pasto, Colombia en 2007. Metodología: Se evaluaron 59 pacientes y se valoraron los índices Quigley-Hein y sangrado de surco, pérdida de inserción clínica, alargamiento gingival, movilidad dental y compromiso de furca. También se analizaron variables como edad, hospitalización, enfermedad mental, otras condiciones sistémicas y medicamentos psiquiátricos. Resultados: El índice Quigley-Hein Index fue 3.05, DE=1.56, el índice de sangrado de surco fue 3.08, DE=1.54. De las mujeres 49.2% tuvieron una pérdida de inserción clínica (PIC) de 7 mm. Existió un incremento del porcentaje de PIC de 5 a 7 mm en pacientes con más de 10 años de hospitalización. Las mujeres con esquizofrenia y retardo mental mostraron PIC de 2 a 7 mm. Las pacientes que ingerían antipsicóticos-antiparkinsonianos tuvieron un PIC de 17 mm. Conclusiones: La enfermedad periodontal es severa en estas pacientes y podría ser influida por la hospitalización, la enfermedad mental y la medicación. Palabras clave: Pacientes psiqui átricos; Mujeres; Higiene oral; Sangrado gingival; Profundidad al sondeo; Pérdida de inserción clínica; Enfermedad periodontal. The concept of mental health includes subjective well-being, autonomy, competition, intergenerational dependency and ability to grow emotional and intellectually. Similarly, it is a state of well-being within which individuals identify their skills; they are able to cope with the normal stresses of life, work productively, and are able to contribute to society. In addition, mental health is related to the possibility of increasing individual and co mmunity competitive accomplishments in order to reach their goals1. When of these concepts are altered individuals may suffer mental disease. The prevalence of mental disorders surpasses 25% in United States. Mental health disorders are the main diagnosis in approximately 9.5%2, of all cases. In 1993, 10.2% of people in several Colombia geographical zones may have a mental disorder3. Nevertheless, according to the last National Study of Mental Health in 2003 in the country, at least 4 out of 10 people had mental disorders over the course of their lifetimes. In this report, affective mental disorder was the most frequent diagnosis; but this percentage has increased 5%4 in the last years. For this reason, health professionals, such as dentists, should be familiar with these types of disorders and their influence on oral cavity, in order to improve their patients’ oral health and overall well-being. One of the most co mmon oral diseases in people without mental illnesses is periodontal disease. It appears in diverse types of patients and at different ages. For instance, in the United States, in individuals from 30 to 39 years old, the prevalence of Slight Clinical Attachment Loss (SCAL) was 17%5. In the same way, the III Estudio Nacional ENSAB III in young Colombian adults from 20 to 24 years old, SCAL was 34%. The previous report also showed that clinical attachment loss (CAL) increases with age and leads to more severe periodontal disease6. In addition, this disease has been associated with different systemic problems, and other health conditions, for this reason, our knowledge about mental disorders and periodontal disease should be enlarged. A study by Lucchese et al.7, in Italy, in 293 patients with mental retardation, 66% had more than 3.5 mm of CAL, 29% had gingival bleeding, dental calculus was observed, and only 5% presented a healthy periodontal condition. On the other hand, a study conducted by Mafla8 in Pasto, Colombia where the oral health status of 229 patients was evaluated, revealed that 55% of individuals with epilepsy had periodontitis, and 54% of women who had epilepsy and mental retardation showed this disease, as well. Three years later, a study by Kenkre et al.9, in India, including 153 institutionalized patients, reported that 5.4% had periodontal health and 16% needed more complex periodontal therapy. Previous analyses showed that psychiatric patients had high levels of periodontal disease. However, these studies do not take into account disease severity. Therefore, this study had two main aims. To determine the periodontal health status of female psychiatric patients from Nuestra Señora del Perpetuo Socorro Mental Hospital at San Juan de Pasto, Nariño, Colombia. To establish if variables such as age, hospitalization, mental disease, other systemic conditions, as well as psychiatric medication are related to these patients’ periodontal health status. An accurate diagnosis of these patients’ periodontal disease will allow us to improve their oral and general health. Nuestra Señora del Perpetuo Socorro Mental Hospital had 225 hospitalized female patients in ages from 15 to 80 years-old between July and December 2007. This group of low-income patients came from different parts of the country. A sample of 137 patients was obtained. The inclusion criteria were that patients must be over 25 years old and have more than 8 teeth. Only 59 (43%) out of 137 patients met these criteria and were evaluated. The study design was previously approved by the Universidad Cooperativa de Colombia, Pasto, Ethics Co mmittee (Act N° CE003-07). All of the oral examinations were performed by a single dentist. The female sample group was evaluated according to oral hygiene, gingival bleeding and periodontal disease extent and severity. The data collection was registered on a periodontal chart, including age, hospitalization; mental disease, other systemic conditions, and psychiatric medications. The last variables were obtained from clinical records. Psychiatric diagnoses were based on International Classification of Mental Diseases (CD-10). The medications were classified into 4 groups because these patients ingested different doses, types and combinations of psychiatric medicine, as follows: group 1: mood-stabilizing medications and antipsychotics, group 2: anti-psychotics, group 3: anti-psychotics-antiparkinsonians and group 4: other psychiatric medications. Oral hygiene and gingival bleeding. Oral hygiene examination was conducted in the hospital’s dental office. Once there, patients received two drops of Quirudent staining solution with erythrosine 2%. They were asked to spread it all over their teeth. For scoring buccal and lingual dental plaque, Quigley-Hein Index modified by Turesky10 was taken. This index varies from 0 to 5; which 0=no plaque, 1=separate flecks of plaque at the cervical margin of the tooth, 2=a thin continuous band of plaque (up to 1 mm) at the cervical margin of the tooth, 3=a band of plaque wider than 1 mm covering less than 1/3 of the crown of the tooth, 4=plaque covering at least one-third but less than 2/3 of the crown of the tooth, 5=plaque covering 2/3 or more of the crown of the tooth. To score gingival bleeding for buccal and lingual surfaces, a sulcus bleeding index11 was assessed. A William-Fox Hu-Friedy® periodontal probe was used to take it. This index had values from 0 to 5, which 0= healthy, 1=bleeding on probing with apparently healthy with no change in color and no swelling, 2=bleeding on probing with change in color due to inflammation; no swelling or macroscopic edema, 3=bleeding on probing with change in color due to inflammation; slight edematous swelling, 4=bleeding on probing with obvious swelling, 5=spontaneous bleeding; changes in color; marked swelling with or without ulceration. Periodontal examination. Periodontal examination was done by a single dentist. A William-Fox Hu-Friedy® periodontal probe was used. The data were collected on a periodontal chart. It included clinical attachment, probing depth, gingival enlargement, tooth displacement, and furcation involvement. For this study clinical attachment was defined as the distance from the cement-enamel junction to the free gingival margin, and probing depth as the distance from the free gingival margin to the bottom of the pocket/sulcus. Gingival enlargement was defined as the distance from free gingival margin to cement-enamel junction. Gingival enlargement diagnosis had values from 0 to 4, where 0=0 to 3 mm, 1=4 mm, 2=5 mm, 3=6 mm, 4=≥ 7 mm. Tooth displacement was defined as tooth movement from buccal to lingual surfaces. The values were as follows: grade I=1 mm, grade II=2 mm, and grade III=≥ 3 mm. Assessment of furcation involvement was made at the mesial, buccal, and distal furcations of maxillary first and second molars, and the buccal and lingual furcations of mandibular first and second molars. A Naber’s Hu-Friedy® probe was used for maxillary and mandibular molars. The sites were scored as grade I=the probe did not pass through the furcation, grade II=the probe passed through the furcation partially and grade III=the probe could be passed between the roots and through the entire furcation. Diagnosis of periodontal disease. Periodontal disease was defined as an illness with an active destruction of the periodontal supporting tissues. Periodontitis was classified by extent and severity. According to the extent, localized and generalized disease classification was taken. Periodontal disease was classified as local when 30% or less of the teeth was affected and as general with greater involvement. Severity of periodontal disease was defined as Clinical Attachment Loss (CAL), taking into account the following criteria: Severe periodontitis: CAL 5 mm, mild periodontitis: CAL 3 to 4 mm and slight periodontitis: CAL 1 to 2 mm12. Statistical data analysis. With respect to Quigley-Hein and Sulcus Bleeding Indexes, mean and standard deviations were obtained. A logistic regression and scatter graph between both variables was carried out. Frequencies, percentages for CAL, probing depth, gingival enlargement, tooth displacement, and furcation involvement were taken and a pie graph for periodontal disease classification was made. The data collected was analyzed using the SPSS program 11.5 version. Fifty nine out of 137 patients selected by means of random sampling fulfilled the above inclusion criteria, indicating that they had severe oral health deterioration. Forty nine percent of these patients had mental retardation as the main psychiatric disease. Sixty nine percent of these women were hospitalized for more than 10 years. According to other systemic condition, 61% of these patients did not have systemic involvement; however, 20% had epilepsy. The group took an average 3.31 medications (SD=1.35). 22% of these patients took mood-stabilizing medications (carbamazepine, valproate acid, lithium) and antipsychotics (clozapine, haloperidol, pipotiazine, levopromazine). 15.3% of these women took only antipsychotics; and 16.9% took antipsychotics and anti-parkisonians such as bipiriden; 45.8% of them took other type of psychiatric medications. Oral hygiene and gingival bleeding. Quigley-Hein Index modified by Turesky was 3.05, (SD=1.56). This value corresponds to a band of plaque wider than 1 mm covering less than 1/3 of the crown of the tooth. 100% of these patients had calculus. Patients with mental retardation had the highest index average (4; SD=0.79). According to other systemic condition, women with epilepsy revealed the smallest index average (2.6, SD=2.2). Sulcus Bleeding Index (SBI) was 3.08; SD=1.54. There were differences in variables such as age and medication intake. SBI was the highest (3.5; SD=1.4) in 35 to 44 year-old patients, in women with mental retardation and also who ingested antipsychotic-antiparkinsonians (3.6; SD=1.3). In Scatter Graphic 1, there is a strong correlation between two indexes (r=0.92). Nevertheless, some psychiatric patients with low levels of dental plaque had greater levels of gingival bleeding. 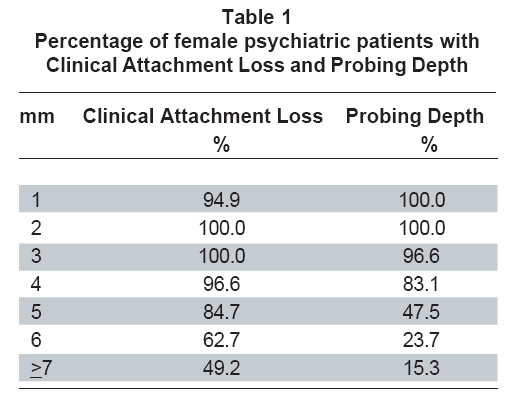 Clinical attachment loss and probing depth. 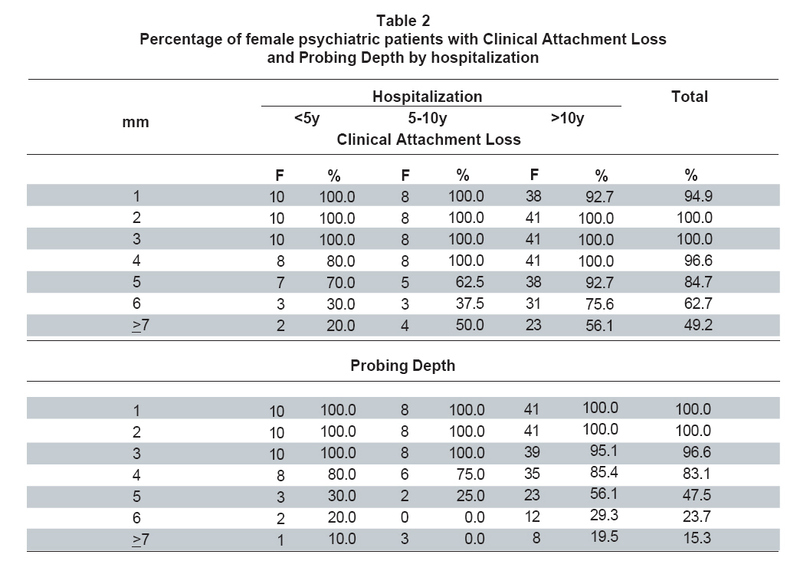 In Table 1, Clinical Attachment Loss (CAL) and Probing Depth (PD) percentages are shown. There were more patients with CAL than PD. Almost all of these patients have a minimum of CAL of 3 mm. CAL and PD were severe within the cohort. For that reason measures over 7 mm, were frequent, as follows: 18 (30.5%) cases had 8 mm of CAL, 12 (20.3%) had 9 mm of CAL, 11 (18.6%) had 10 mm of CAL, 7 (11.9%) had 11 mm of CAL, and 1 (1.7%) had 12, 13, 15, and 17 mm of CAL. A PD of 8 mm was observed 9 (15.3%), 8 (13.6%) patients had 9 mm of PD, and 2 (3.4%) had 10 mm of PD. Variables such as, age, hospitalization, mental illness, other systemic condition, ingested medications were analyzed. The CAL increases with age, but not in a sequential pattern. A minimum of 2 to 3 mm of CAL was observed in these women. Behind 6 mm of CAL, the values increased steadily when increasing the age. On the other hand, the degree of PD showed a different relationship with patient’s age. Patients from 45 to 65 years-old displayed 4 mm of CAL, and after this age bracket the degree of CAL peaks. Furthermore, almost 50% of 55 to 64 year-old women had CAL from 5 to 6 mm, however, in 65 year-old patients there is not longer those measures. CAL between 8 to 9 mm was frequently observed after 65 years-old. The 65 year-old patients showed PD between 8 to 11 mm, 13 and 17 mm as well; while PD of 12 and 15 mm was observed in patients with ages from 45 to 54 years-old and PD of 10 mm was revealed in patients with ages from 35 to 44 years-old. The percentages of patients with 4 mm of CAL were similar in patients hospitalized for 5-10 and >10 years. The greatest values of these two measurements, as 5, 6 and 7 mm or more were present in patients who had more than 10 years of hospitalization. The CAL from 8 to13 mm, CAL of 15 and 17 mm also was observed in this period, in the same way, PD from 8 to 10 mm (Table 2). In Table 3, patients with schizophrenia, bipolar affective disorder, and schizoaffective disorder had CAL from 1 to 3 mm, while patients with schizophrenia and mental retardation showed CAL from 2 to 7 mm. Patients with different mental disorders had at least 3 mm of PD, however, patients with mental retardation only, and those with schizophrenia and mental retardation had from 4 mm to the highest values of PD. The CAL from 8 to 11 mm and CAL of 13 mm were observed in these previous patients, and CAL measurements of 12, 15 and 17 mm were frequent in women with mental retardation, in the same way that PD from 8 to 9 mm. Patients with epilepsy and epilepsy-hypothyroidism had CAL from 1 to 5 mm frequently and the percentage of patients with PD increased after 4 mm of this measure. Patients with epilepsy showed CAL from 10 to 12 mm and 15 mm and PD of 9 mm. Patients who took any medication had at least 4 mm of CAL values; however, there was an increasing percentage of women who ingested antipsychotics-antiparkinsonians with 5 mm measurements of CAL or more. Similar percentages of patients who took any type of medications had 3 mm according to PD. Nevertheless, up to 4 mm of PD, there was an increasing number of women who ingested antipsychotics-antiparkinsonians and other medication. Women who took antipsychotics had values from 8 to 13 mm and 15 mm of CAL. Patients who ingested antipsychotics-antiparkinsonians had CAL of 17 mm and CAL from 8 to 10 mm, were observed in patients who ingested antipsychotics only. Gingival enlargement. Six women (10.2%) had gingival enlargement (GE). There was no difference of percentages regarding to age. In variables such as hospitalization, 5 patients (12.2%) who stayed more than 10 years had GE. GE was diagnosed in one woman (25%) who had bipolar affective disorder and in one patient (14.3%) with mental retardation. 3 cases (25%) of these patients did not have other systemic condition. Regarding medications, 2 women (15.4%) that had GE ingested antipsychotics-mood stabilizing medications and in 4 cases (14.8%) took other type of medications. Tooth displacement and furcation involvement. Tooth displacement (TD) was present in 57.6% of these women. The latter percentage was distributed as follows: 19 cases (32%) had TD grade I, 12 women (20%) showed TD grade II and 3 patients (5%) had TD grade III. 5 women (8%) had furcation involvement (FI) grade I. Eleven patients (26.8%) who stayed hospitalized more than 10 years had TD grade II and in 3 cases (7.3%) TD grade III. Moreover, one patient (12.5%) who had stayed 5 to 10 years at hospital had FI grade I. 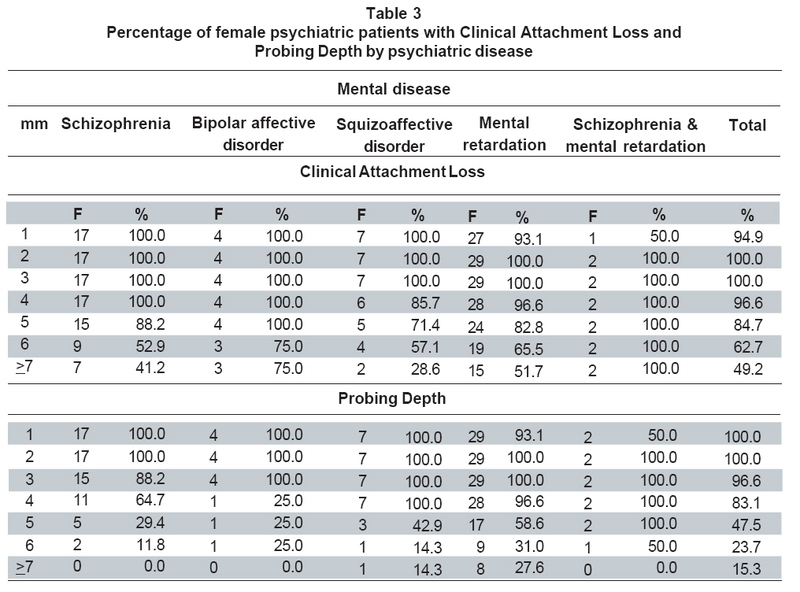 Eight patients (47.1%) with schizophrenia had TD grade I, however, 5 women (17.2%) with mental retardation had TD grade II and 2 (6.9%) TD grade III. Three patients (10.3%) with mental retardation had FI grade I. Five patients (50%) who ingested antipsychotics-antiparkinsonians had TD grade I and in 4 cases (44.4%) who ingested antipsychotics showed TD grade II. One woman (11.1%) who took antipsychotics had TD grade III. 5 cases (18.5%) who ingested other type of medications had FI grade I.
Periodontal disease diagnosis by extent and severity. No one patient had periodontal health. In this sense, 84.7% had periodontitis and 15.3% had gingivitis. Accordingly to severity and extension, 44.1% of these women had a localized periodontitis and 40.6% generalized periodontitis. The 15.3% of these patients showed gingivitis induced by dental plaque (GIP), where 1.7% had a localized GIP and 13.6% general GIP. Different diagnosis of periodontal disease regarding to severity and extension are observed in Graphic 2. Periodontal diagnosis was analyzed with variables such as age, hospitalization, psychiatric disease, other systemic condition and medication. With respect to age, 6 patients (50%) from 25 to 34 had Localized Middle Periodontitis (LMP), 8 women (53.3%) from 35 to 44 years-old had Generalized Middle Periodontitis (GMP) and in 4 cases (25%) from 55 to 64 year-old showed Generalized Severe Periodontitis (GSeP). Four patients (40%) who stayed hospitalized 5-10 years had LMP, 3 women (37.5%) who also stayed less than 5 years had LMP. Twelve women (29.3%) had generalized slight periodontitis (GSP) and LMP, and 7 cases (17.1%) were hospitalized more than 5 years had (GSeP). According to mental disease, 9 patients (52.9%) with schizophrenia and 4 women (57.1%) with squizoaffective disorder had LMP. Five patients (17.2%) with mental retardation showed GSeP. Four cases (66.7%) with epilepsy and hypotiroidism had LMP, 5 women (41.7%) with other type of disease had GMP and 2 individual (16.7%) had GSeP. Regarding medications, 7 patients (53.8%) who ingested mood-stabilizing medications had LMP and 2 women (22.2%) who took antipsychotics had GSeP. Nuestra Señora del Perpetuo Socorro Mental Hospital is an institution that offers services to patients who have low incomes and education levels. These conditions are commonly present in undeveloped countries and could be associated with malnutrition and periodontal disease. Only 59 women met the inclusion criteria, thus, 43% of these patients had more than eight teeth, while 57% had fewer than 8 teeth or were edentulous. Studies by Mafla8 in 1998, in Pasto, and by Kumar et al.12, in India also confirmed that hospitalized psychiatric patients display poor oral health. Tooth loss was substantial in this population and may be the consequence of oral diseases such as periodontal disease or dental caries. Even though dental trauma, hypodontia, or oligodontia might also cause tooth loss, those, could no longer be assessed in these individuals. For this reason, it is difficult to determine an accurate oral health diagnosis. Forty nine percent had mental retardation as their primary psychiatric diagnosis. Twenty percent of these patients had an additional diagnosis of epilepsy. The group ingested an average of 3.3 medications. It was higher than found by Velasco et al.13, in an institutionalized patients study in Spain which estimated a 2.1 average. Psychiatric medications influence on oral health because of collateral effects. For example, 22% of these women ingested mood-stabilizing medications (carbamazepine, valproate acid, and lithium), that produces xerostomy and carbohydrates eating anxiety and antipsychotics (clozapine, haloperidol, pipotiazine, levopromazine) which are associated with effects like gingivitis, and stomatitis14. In this study, patients ingested different doses, types and combinations of psychiatric medicine. For this reason, we can’t conclude with accuracy the real effects of this medicine. Oral hygiene and gingival bleeding. Quigley-Hein Index modified by Turesky was taken for oral hygiene evaluation. The index was 3.05, which meant patients had a band of plaque wider than 1 mm covering less than 1/3 of the crown of the tooth. One hundred percent of these patients had calculus. Dental plaque peaks in patients with mental retardation showing an average of 4. This psychiatric illness is normally present at birth or develops early in life. It is a developmental disability that is marked by lower-than-normal intelligence and limited daily living skills which affect a correct oral hygiene more than other mental diseases. Although other systemic conditions influence on oral hygiene, it was interesting to observe that some patients with epilepsy had lower average oral hygiene indexes than others. One hundred percent of these women had gingival bleeding, this percentage was higher than the study reported by Lucchese et al.7, in Italy in 1998, which found that only 29% patients with mental retardation presented it. With respect to SBI an average of 3.08 was observed. It meant change in colour due to infla mmation and slight edematous swelling. Sulcus bleeding and Quigley-Hein indexes had a strong correlation; nevertheless, some cases with low levels of dental plaque had high levels of gingival bleeding. According to age, patients from 35 to 44 years-old, had the greatest Sulcus Bleeding Index (SBI) (3.54). This result suggests that hormonal changes produced by medications ingest or by themselves, may promote xerostomy, or gingival bleeding and some similar collateral effects. Regarding medications, women who took antipsychotics-antiparkinsonians had the greatest levels of gingival bleeding. It could happen because those medications lead to gingivitis and stomatitis, while, antiparkinsonians to xerostomy. Clinical attachment loss, probing depth and gingival enlargement. There was a greater CAL in psychiatric patients compared to patients without mental disease in the literature5. In this sense, one hundred percent of these psychiatric patients had CAL of at least 2 to 3 mm, while 77.4% of mental health patients showed 2 mm of CAL and 48.6% 3 mm of CAL. Ninety-six point six percent of these women had 4 mm of CAL, while 27.7% of mental health patients showed it. After measures of 5 mm of CAL the percentage of women with mental disease peaks whereas healthy patient decreased. Furthermore, 49.2% psychiatric patients had 7 mm of CAL while 5% of women with mental health. Regarding age, percentages between 83% and 100% of psychiatric patients had CAL from 1 to 4 mm whilst in healthy women varied from 12.5% to 99.9%. It means that CAL in psychiatric patients seems to be similar, but not in mental health ones in the literature5. However, after CAL of 5 mm their CAL can fluctuate according to age group. This diagnosis was comparable with Luchesse et al.7, study in psychiatric patients in which there were not differences by age. On the other hand, in mental health patients CAL increases with the years5. Ninety six point six percent of these patients showed Probing Depth (PD) of 3 mm, percentage higher than found by Albandar et al.5, in which estimated that 63.9% mental health patients had it. The percentage of psychiatric patients with PD of 4 mm was 4 times greater than mental health ones approximately. However, after 5 mm of PD these measures fluctuate between 2 and 7 times more in these patients than healthy ones. The CAL could increase because these women had gingival recession by presence of calculus. Although it might also be associated with factors such as brushing trauma, abnormal frenula attachment, dental malposition15, or aspects like diet, i.e. ingestion of things different from food, and in some cases self-injuries16. However, PD is produced by dental plaque accumulation and host response at it. Patients who stayed more than 10 years hospitalized showed the greatest values of CAL and PD from 5 to 7 mm. Women with schizophrenia and mental retardation presented CAL and PD from 2 to 7 mm. In this study 74.1% patients with mental retardation had greater values than 3 mm of PD, while in Luchesse et al.7, study 66% of those patients had the same measures. According to other systemic condition, patients with epilepsy and epilepsy and hypothyroidism presented CAL from 1 to 5 mm. Women who ingested antipsychotics-antiparkinsonians had the greatest values of CAL. The measurements of PD were similar in all of individuals who took different medications, although 22% of these patients that ingested antipsychotics showed 7 mm of PD. Ten point two percent of these patients had gingival enlargement but it was not associated with medications or other systemic condition. However, some reports reveal that disease such as epilepsy was associated with ingestion of anticonvulsivants, valproate acid, or carbamazepine17. Tooth displacement and furcation involvement. Fifty seven point six percent of these women had tooth displacement. Twenty percent of them had Grade II, 5% of these patients had Grade III. The latter information suggests that maybe extractions could be the first option to solve this problem. The tooth displacement causes are not only associated with bone loss, but factors such as functional hyperactivity like bruxism, alveolar dental trauma or an unfavorable crown-root ratio. It has been demonstrated that some antipsychotics medications produce functional hyperactivity. It includes damages of the occlusal surfaces like enamel and dentine16. Eight percent of this psychiatric patients had furcation involvement (FI) Grade I. It means a horizontal bone loss less than 1/3 of tooth. Involvement furcation diagnosis was not frequent in these patients due to higher number of molars loss. Periodontal disease. Periodontal disease is a chronic bacterial infection that affects the gums and bone supporting the teeth. Periodontal disease can affect one tooth or many teeth18. It settles down when gums lose their attachment to the teeth as a result of an infla mmatory response to dental plaque. It is characterized by attachment loss, periodontal pocket, alveolar bone loss, enlargement or gingival recession and bleeding after pressure, tooth displacement or exfoliation can appear. The periodontal disease could develop any time of the life, but prevalence and severity can increase with age. 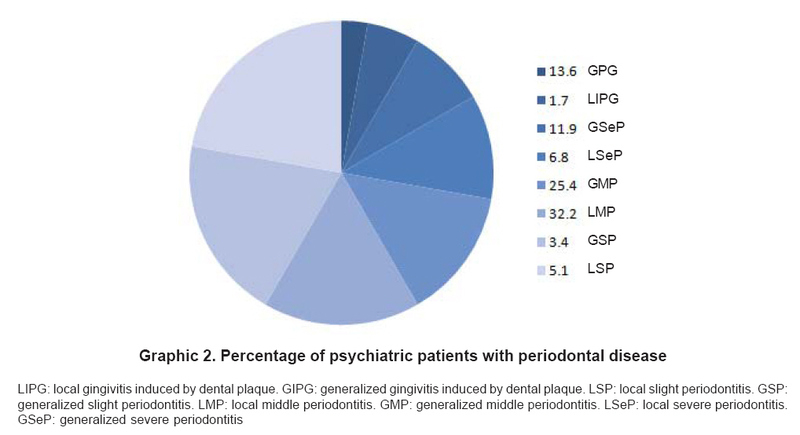 No one showed periodontal health in these patients, although in a study by Kenkre et al.9, in 2000 in India 5.4% of psychiatric patients had at least periodontal health. With respect to periodontal disease severity 15.3% had gingivitis induced by dental plaque, 8.5% showed slight periodontitis, 57.6% had mild periodontitis and 18.7% presented severe periodontitis. According to periodontal disease extension, 44.1% showed localized periodontitis in different grades, while 54.2% had generalized periodontitis. These outcomes show there would have severe periodontal disease and as consequence teeth loss could increase. Regarding age, 50% of these patients between 25 to 34 years-old had localized mild periodontitis (LMP). In this same age, 53.3% showed a generalized mild periodontitis (GMP). However, 25% of women from 55 to 64 years-old presented generalized severe periodontitis (GSeP) which was the worst condition. 17.1% of these patients who had been hospitalized more than 10 years had GSeP. A study by Fleck et al.19, in Brazil in 2007 reported that confinement for many years increases negative symptoms in patients, since 59% had between mild and severe problems in performing daily personal hygiene habits. That means, it would be necessary to control women oral hygiene to avoid their oral health deterioration. According to mental disease, 17.2% of these women with mental retardation had GSeP. The results found by Gabre et al.20, in 1999 with respect to periodontal severity showed that 58% of patients with mental retardation had lost their teeth because of periodontal disease. This kind of patients uses neuroleptic medications, which are characterized by collateral effects such as hyposalivation that contribute to growing and colonization bacteria being one of the main causes of periodontal disease and dental caries21. On the other hand, 52.9% of women with schizophrenia had LMP. Even though in a study by Tang22 in 2004 in Hong Kong, it was found that 73% of men with schizophrenia had LSP which was a less severe condition than these Hospital patients. Schizophrenia is a psychiatric disease characterized by hallucinations, delusions, disordered thinking, movement disorders, flat affect, social withdrawal, and cognitive deficits, but these do not happen almost all of time. It means patients could do their daily basic activities and oral hygiene better than other type of patients. According to other systemic condition, 66.7% of patients with epilepsy and hypothyroidism presented LMP. Epilepsy patients frequently ingest medications as phenitoyn; one of its collateral effects is to produce gingival enlargements (GE). Although anticonvulsivants medication as phenitoyn was used in these women, GE was not diagnosed. It is possible that medication had not been increased at plasmatic level. The study by Güncü et al.23, in 2006 establishes that only when phenitoyn plasmatic levels increase there could be present gingival enlargement induced by this medicine. With respect to psychiatric medications, 53.8% of women who took mood-stabilizing medications had LMP. Medications such as carbamazepine, valproate acid, lithium and antipsychotic are also associated with xerostomy, and antipsychotics to gingivitis and stomatitis14. Twenty two point two percent of these patients that took antipsychotics had GSeP. The presence of dental plaque increases periodontal disease, and the collateral effects of those medications might contribute to gingivitis and stomatitis development, as well. Patients from «Nuestra Señora del Perpetuo Socorro Mental Hospital» had a more severe periodontal disease than mental health patients and other psychiatric patients from the literature. Periodontal disease might be influenced by hospitalization, mental illness, and medications side effects, and it is possible that socioeconomic conditions could contribute to increase this disease. In addition, gender matter would not only generate biology hormonal changes themselves but additional hormonal changes induced by medication which may imply a worse periodontal status, as well. The Research Group wants to thank to «Nuestra Señora del Perpetuo Socorro Mental Hospital» General Director and Dr. Mauricio de la Espriella for his explanations about mental diseases. The group also wants to thank to María Eudosia Tello for her help with psychiatric patients and Dr. Matthew Blake Greenblatt for his assistance and English grammar corrections of the manuscript. Kessler RC, Chiu WT, Demler O, Merikangas KR, Walters EE. Prevalence, severity, and comorbidity of twelve-month DSM-IV disorders in the National Comorbidity Survey Replication (NCS-R). Arch Gen Psychiatry. 2005; 62: 617-27. Ministerio de la Protección Social. Centro Nacional de Consultoría. Estudio Nacional de Salud Mental. Bogotá: MinProtección Social; 2003. Albandar JM, Brunelle JA, Kingman A. Destructive periodontal disease in adults 30 years of age and older in the United States, 1988-1994. J Periodontol. 1999; 70: 13-29. Ministerio de la Protección Social. Centro Nacional de Consultoría. III Estudio Nacional ENSAB III. II Estudio Nacional de Factores de Riesgo de Enfermedades Crónicas (ENFREC II). Tomo VII: Estudio Nacional de Salud Bucal. Bogotá: MinProtección Social; 1999. Lucchese C, Checchi L. The oral status in mentally retarded institutionalized patients. Minerva Stomatol. 1998; 47: 499-502. Mafla AC. Salud oral en pacientes psiquiátricas. Asociación Colombiana de Epidemiología (ASOCEPI). X Jornadas de Epidemiología. Cali, Colombia, 13-15 de octubre de 2000. Kenkre AM, Spadigam AE. Oral health and treatment needs in institutionalized psychiatric patients in India. Indian J Dent Res. 2000; 11: 5-11. Cuenca-Sala E, Baca-García E. Odontología preventiva y comunitaria. Principios, métodos y aplicaciones. 2ª ed. Barcelona: Masson Editores; 2005. p. 355. Kumar M, Chandu GN, Shafiulla MD. Oral health status and treatment needs in institutionalized psychiatric patients: one year descriptive cross sectional study. study. Indian J Dent Res. 2006; 17: 171-7. Velasco E, Machuca G, Martínez-Sahuquillo A, Ríos V, Lacalle J, Bullón P. Dental health among institutionalized psychiatric patients in Spain. Spec Care Dentist. 1997; 17: 203-6. Friedlander AH, Friedlander IK, Marder SR. Bipolar I disorder. Psychopathology, medical management and dental implications. JADA. 2002; 133: 1209-17. Kassab MM, Cohen RE. The etiology and prevalence of gingival recession. J Am Assoc. 2003; 134: 220-5. Lucavechi T, Barbería E, Maroto M, Arenas M. Self-injurious behavior in a patient with mental retardation: review of the literature and a case report. Quintessence Int. 2007; 38: 393-8. American Academy of Periodontology. Drug-associated gingival enlargement. J Periodontol. 2004; 75: 1424-31. Fleck MP, Wagner L, Wagner M, Dias M. Long-stay patients in a psychiatric hospital in Southern Brazil. Rev Saude Publica. 2007; 41: 124-30. Gabre P, Martinsson T, Gahnberg L. Incidence of, and reasons for, tooth mortality among mentally retarded adults during a 10-year period. Acta Odontol Scand. 1999; 57: 55-61. Dahllöf G, Preber H, Eliasson S, Rydén H, Karsten J, Modéer T. Periodontal condition of epileptic adults treated long-term with phenytoin or carbamazepine. Epilepsia. 1993; 34: 960-4. Tang WK, Sun FC, Ungvari GS, O´Donnell D. Oral health of psychiatric in-patients in Hong Kong. Int J Soc Psychiatry. 2004; 50: 186-91. Güncü GN, Caglayan F, Dinçel A, Bozkurt A, Saygi S, Karabulut E. Plasma and gingival crevicular fluid phenytoin concentrations as risk factors for gingival overgrowth. J Periodontol. 2006; 77: 2005-10.